Ensure continuous protection with VitalLink — the most reliable way to be sure your security signal is constantly in touch! Click the link above for more. A smoke detector on every level and in each sleeping room — that's the new home building code requirement. Your electrician can install them, and that's good, but who hears them when you're away? Who's calling the fire department when you need to evacuate? We can help by installing smoke and heat detectors as part of a supervised system with battery backup in case the power goes out. Our hardwired detectors contain no batteries, so no worries about failure, replacement, or forgetting to maintain them. Our wireless units feature long-life supervised lithium batteries. Why not consider these valuable life savers when you look at a security system for your family? Using quality products from top manufacturers, we can secure your family, pets, home and property. Nothing is more important to SSC than designing and installing a system that not only meets your needs, but gives you peace of mind every time you arm your life-safety designed security system. It's not about your possessions; it's about you and yours. Let us help you protect your family. These systems are easy to use. Access your system from your cell phone or computer at work if you want to! Medical issues are sudden. Emergencies can leave you unable to get to a phone. Whether as a separate system or as part of an SSC-installed security system, the protection we offer can bring you or your loved ones help when needed most. 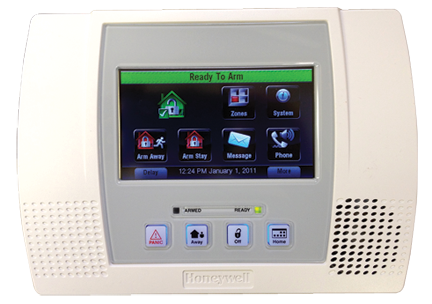 We've installed complete security/fire systems with medical alerts included for less than many medical alert companies charge for their Medical Alert System alone! Do you use security video around the house? More and more it's becoming a part of life. Want to see the pictures on your television, computer or separate monitor? No problem. Low-light capabilities and long term recording with our equipment allow you to see what you need to. Want to view your cameras when you are away from home? Now you can — from a mobile device, telephone, or your office! You can even see who's at the door and talk to them when you're not home. Talk to your visitors before you open the door. Call out to the garage or other outbuilding. Carbon monoxide can be very dangerous. Wireless or wired, we can protect your family from this killer. Make it a part of your monitored security system so you can get help, even if calling is not possible. Do you like to know what is going on at home? Gate opened? Door bell rung? Too warm, too cold? Tell us, we'll help you track it! With so many couples working today, sometimes you just can't be there when the kids come home. So you worry until you get home, or get a call from them. We can let you know when they open the door and turn off the alarm. We can even send you pictures of their arrival to make sure they made it into the house safely. Someone is coming up the drive! Know who it is before they knock on the door.